What makes your heart go pitter-pat? 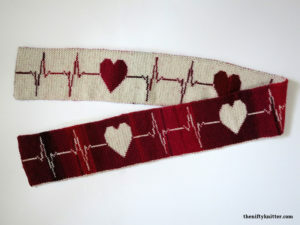 The Pitter-Pat Scarf features the traditional EKG line of a heartbeat interspersed with hearts. 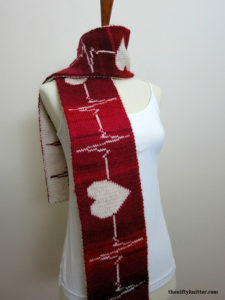 Give to a loved one or wear to show your love for the human heart! 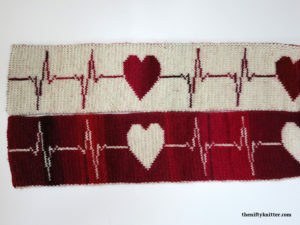 A great gift for anyone in the health industry. 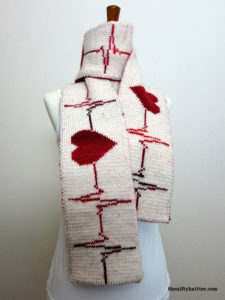 Double knit, this thick scarf features the heartbeat design on both sides, with opposite color schemes on each side. Use contrasting colors to show off the design. Full instructions are included for the double knitting technique. The finished length of the scarf is approximately 60 inches (152 cm), and can be adjusted in intervals of approximately 12 inches (30.5 cm). Size 5 US (3.75 mm) needles. Size 4 US (3.5 mm) needles (optional for a neater cast on edge). Approximately 250-275 yards each of two contrasting colors of worsted weight yarn for an approximately 60 inch (152 cm) length scarf. Length can easily be increased or decreased in intervals of approximately 12 inches (30.5 cm).